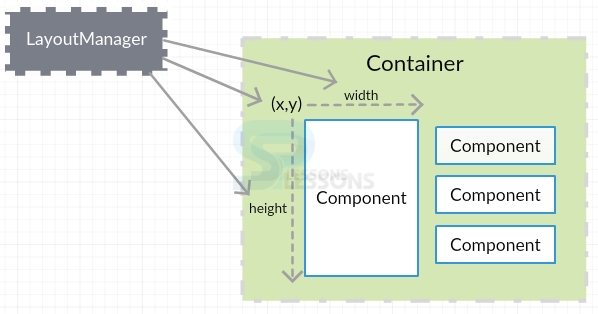 Swing Layout can be described as “arranging the available components in a proper manner” in the container. The functionality of the layout will be automatically done by Swing Layout Manager. Layout Manger automatically arranges the components in a proper manner, even if the developer does not use Swing Layout manger components will be arranged by the default layout manager. Some times it is difficult to know the size and width of the window application so layout manager creates object to the every container. Following is the declaration of Swing Layout Manager. Types of layouts are as follows. The functionality of FlowLayout is sort the available components in sequential order and this is the default layout. FlowLayout consists of alignment fields as follows. public static final int CENTER—->To keep the center alignment. public static void int LEADING—>To identify the leading alignment of the text. public static void int TRAILING—>To identify the trailing alignment of the text. Below is the source code to perform flow layout in the window application. Create a class with the name SwingFlowLayout and create a constructor that should be same as class name and create a frame also. Write the component elements and create a button to each and every component. Add the object of the buttons to the frame then components will be placed in frame. Set the alignment of the FlowLayout as center or right or left and create the title, size to the window application. After executing the above code successfully,output will be as follows.Where all the components are in the sequential order i.e is SPLESSON. 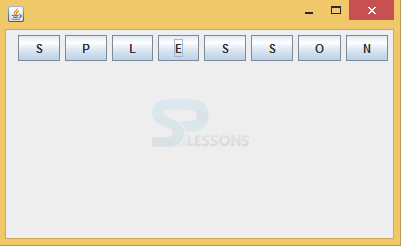 The functionality of BoxLayout arranges the components in window application as a row model or column model. The classes of BoxLayout will be found in Java. swing package. The fields of BoxLayout are as follows. This example shows how to keep components in window at right bottom place. Create a class with name BoxLayout that should extend the JFrame to inherit the properties and create a constructor that should be same as class name. Create two panels, one is vertical panel and another one is horizontal panel. Vertical panel is default panel and the bottom panel is horizontal panel(x_axis). Create two buttons and provide the space between the components by using rigid area. 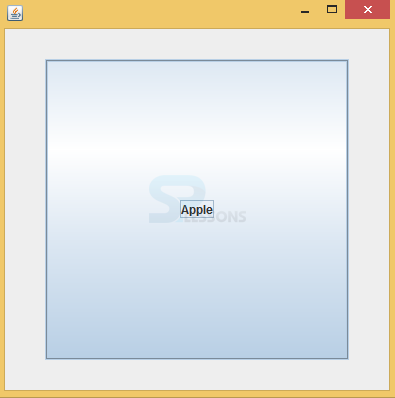 Set the title, bounds to the window and write the function to close the window application and write the function to place the window in center of the screen. Write the main method and create the object to the class name to visible the window application. After executing the above code successfully, output will be as follows. Where created two buttons OK and CLOSE at right bottom of the window. The functionality of GridBagLayout is place components in rectangle, grid, where one component will be in one rectangle, grid only. The fields of GridBagLayout will be available in Java. awt. GridBagLayout class. 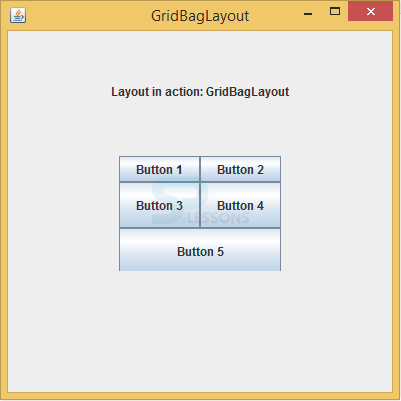 GridBagLayout () is the constructor used to create the layout manager. The basic difference between the GridLayout and GridBagLayout is that in GridLayout components will be in a rectangle, grid with same size, in GridBagLayout components will not be in the same size and it is not required. Below is the source code to perform grid bag layout. Create a class and import all the packages to built GriBagLayout. Create a class and include required frames, labels, panes and create a constructor also. Write main method and create a object to the class and use that object. Set the title and size of the frame and set position of header label and status label. Add WindowListener and WindowAdapter to the main frame and write the function to the frame. Add header label, status label, control panel into the frame. Add the text into the header label and color to the panel. Output will be as follows. Where components are not in similar size, in GridLayout components will be in rectangle grid shape. The functionality of BorderLayout is place the components in five directions of the window such as north, south, east, center, west. Where each region may have one component. The fields of BorderLayout are as follows. 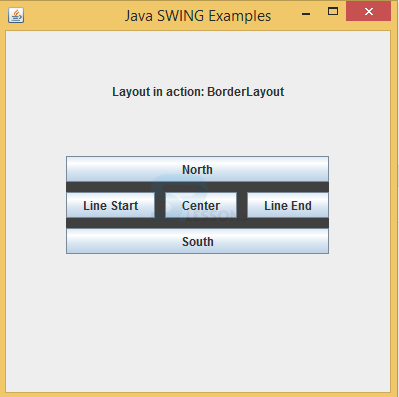 Below is the source code to perform border layout in an application window. 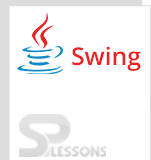 Create a class with the name SwingLayoutDemo and create frame, header label, status label, control panel. Create a constructor and write main method and create object to the class and use that object to add frame. Add the WindowListener and write the method to close the window application. Set the text to the header label, create object to the panel and add the color to the panel. Output will be as follows. Where added the color to the panel that is gray dark color and the region of the components also shown in the output. The functionality of CardLayout arranges the components in a sequential manner and only one component is visible at one time. Here one component will be treated as a one card, cardlayout (); is the constructor without horizontal and vertical gaps. Below is the source code to perform card Swing Layout in the window. Import all the required packages to inherit the properties. Create a class and that should extend the JFrame and should implement the ActionListener. Create card Swing Layout, buttons and constructor also. Add the button names and add action listeners to the components. 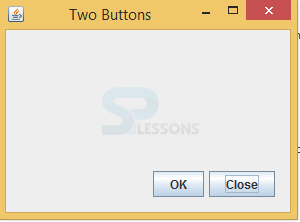 Create the main method and write the method to close the window. click on the window remaining components will be visible. GridLayout components will be in rectangle grid with same size, in GridBagLayout components will not be in same size. In card Swing Layout only one component is visible. Swing Layout manager is used to arrange the components in a sequential manner.